Born in Eritrea during a brutal war, Senait never imagined she would one day attend an elite Illinois college. Along with a million Eritreans and Ethiopians displaced by war, Senait and her family fled their home. They spent six years living in a refugee camp. 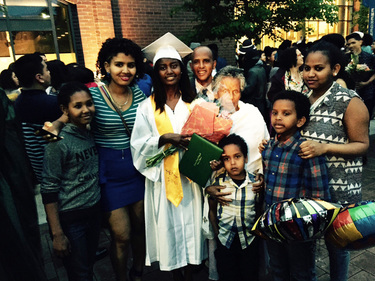 When Senait was nine years old, she came to the U.S. with her mom and five siblings. When the family arrived, RefugeeOne helped them find an apartment, signed up Senait’s mom for our on-site English classes, and enrolled the siblings in quality schools and our youth program. We also helped her mom get a job at the James Hotel in 2007 – and she’s still working there today. Later, we helped many of Senait’s family members become U.S. citizens. School was challenging for Senait at first. Because students in the U.S. are placed in class based on their age, Senait was enrolled in the fourth grade – despite not speaking any English. Thankfully, through her involvement with RefugeeOne’s youth program, Senait and her siblings quickly improved their English and made new friends. RefugeeOne’s after-school program runs every weekday. Youth receive one-on-one support from staff and volunteer tutors as they work on their homework and English language acquisition. After class work, there are team-building games, journaling, sports practice and time to just play. One-on-one tutoring is also provided in the youth’s home by specially trained volunteers. With RefugeeOne’s help, Senait received a scholarship last summer to participate in The Road Less Traveled, a community service program. She traveled with other youth to New Orleans to rebuild three houses destroyed by Hurricane Katrina. She also cooked gumbo for the first time, visited the French Quarter, and saw alligators while riding a boat on the bayou. The trip prepared her for the new adventures that lie ahead. This fall, Senait will attend Lake Forest College, one of Illinois’ most elite liberal arts schools, to study biology and psychology. She will be the first person in her family to attend a four-year college and she hopes to one day become a doctor. Senait’s journey to college is more than just an academic achievement; it’s the embodiment of how a young woman’s dedication, a family’s resilience and a community’s support can make the unimaginable a reality. Senait’s first year of college was a great success! She “made the library her second home” and got A’s as a result, making lots of new friends along the way. After a year of class experience and some discussion with her professors and advisors, she has decided to pursue pharmacy. Senait’s mom is still employed at James Hotel and doing well.